I love kale. What’s not to love? This superfood one of the healthiest greens around. It’s high in fiber & antioxidants, & an excellent source of nutrients – especially vitamin A & calcium. It’s also one of the best sources of beta-carotene. There are so any ways to enjoy kale – steamed, stir fried, blended into a smoothie, pressed through a juicer, baked into crispy chips, & one of my favorite ways – eaten raw in a salad. While my typical daily dose of kale usual comes from a juice or green smoothie, the raw kale salad is truly a favorite simple pleasure. However, raw kale can be quite tough & fibrous, but with a little secret effort it can be transformed into a delicious tender green. The secret? “Massage” it! Grab it with both hands & give the leaves good rub down. I mean really get in there, it’s like kneading bread dough. Why massage it? It helps to break it down without depleting the nutrients, & turns the fibrous leaves into a soft silky texture. Its raw bitterness also mellows & makes it even that much more delicious. I like to massage my kale with avocado & sea salt, & then add some citrus or apple cider vinegar to brighten the flavor. Next, I’ll toss in shredded carrots, beets, apples, tomatoes, etc. – really, whatever that’s in season. Place kale in a large bowl with the avocado. Add salt. Mix very well, “massaging” the greens with the salt & avocado for approximately 3 minutes. 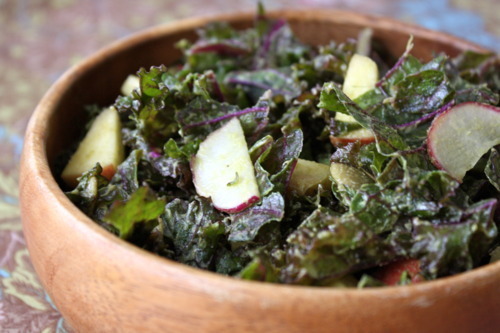 Gently toss kale with apple cider vinegar, apples, radishes & pepitas. Taste & season with additional sea salt if needed. 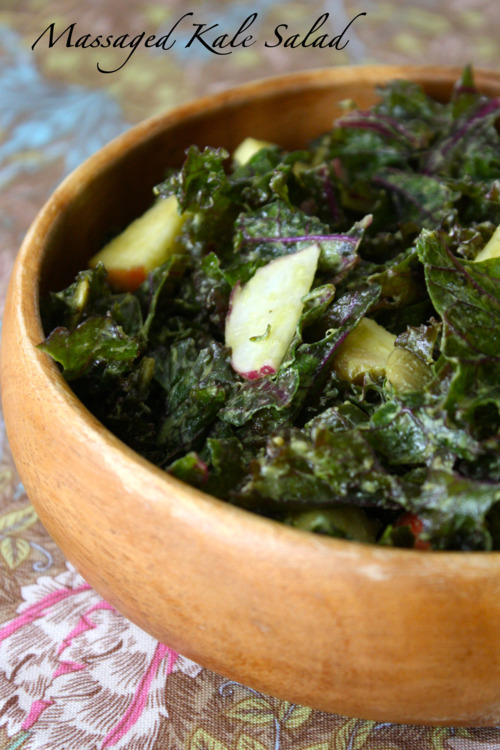 If you’ve never tried a massaged kale salad, I double-dog dare you to give it a try! In my experience, it turned even the most wary suspect into an instant kale lover. Enjoy!